Celebrities are usually referred to as role models though not all of them deserve to be. But I’d like to think that we do learn from the people we idolize and I hope it’s mostly good and not bad habits. In celebration of Arashi’s 15th year, I did some kind of crowd sourcing on Twitter on the things that we have learned from Arashi. I was pleasantly surprised at the response I got and touched by the answers. 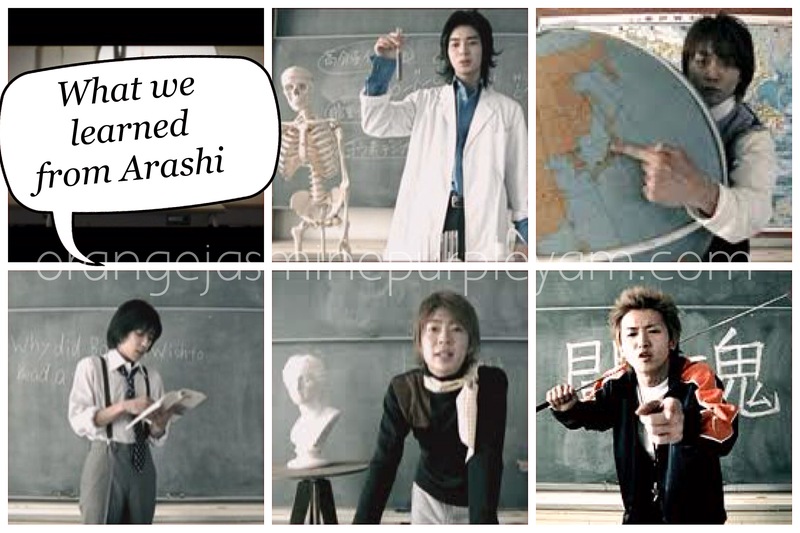 I have to note that many of the answers that came in were along the same vein, which only goes to show that we have all been attending the same class being taught by our Arashi senseis. Thank you to everyone who helped me compile this list, your individual contributions are duly quoted below. Idols need not be perfect. They’re human and they have human foibles as well, just like you and me. They also need not go for plastic surgery just to be appealing to fans. It’s okay to have acne scars or snaggle tooth. There are lots of stories that they occasionally share on how they are especially with their parents. (Example: Sho takes his parents to watch Sir Paul McCartney. Jun takes his mother to the chiropractor.) Despite their busy schedules, they make time for family. You can start again from there, right? No need for professional jealousy. Everyone will have a chance to shine. One’s success is everyone else’s. One word, or rather, name: Nino. It does not mean that just because you earn money, you’re going to spend it all. This is not just their personal philosophy (except for Jun who spends his money on fashionable clothes), but they apply it with the fans as well. They have had long discussions with their production staff to lower the price of their DVDs, in particular, because they don’t want the fans to earn money just so they can buy their merchandise. Nino even advised fans to spend their money on more important things. Arashi has no illusion of grandeur when it comes to idolhood. They rather have a practical outlook at things in general. They know that one day, everything will come to pass and their time in the spotlight will be over. Nino has been very vocal about discussing retirement, for one. Arashi members have very good relationships with other people in the industry (Tsumabuki Satoshi and Oguri Shun are among well-known Arashi bffs) but they also have maintained friends since their middle school/university days (in the case of Jun and Sho). It’s well known how Arashi can be strict ojisans when it comes to fan behavior. They hate being stalked or followed, they even frown at fans meeting them at airports or taking the same ride as them. I personally learned that as a good fan, I don’t need to give them anything. As Nino said, celebrities have most everything, what else can I give them that their sponsors haven’t given them or they can’t afford to buy themselves? I personally frown on giving fan gifts, it’s a pointless exercise. The best way to be a fan is to buy their albums, DVDs/BDs, watch their concerts, dramas or films. In short, patronize their projects because they do that for the fans. That’s the best gift we can give them, by supporting their endeavors and then letting them live their life away from the spotlight. Not everything in life need to be complicated or full of drama, especially fangirling. Thank you, Arashi, for teaching us how to live life, for showing us that it’s okay to make mistakes and learn from them, to brush ourselves off after every fall and move forward never looking back because the future is ahead and not behind us. Most of all, thank you for being you, scars, faults, charm and all. Congratulations on your 15th year and wishing for more years of Arashi goodness to come!!! Its awesome how you analysed it. Salute!!!! Since I can’t do it like you, all I can do is read and feel awesome when read your blog/post. Once I came across your post about Arashi that despite being together for so long, they still have some space to their relationship. The analogy is like relationship between colleagues. I think it yours post and I tried to search it but failed. p/s This night I will dig my hard disk to find the GnA where Nino called Matsujun as ‘King’. yes indeed, we are growing together with them! as Riida said on his radio program yesterday, perhaps the fans thought at the start that they were hopeless. but look at how they’ve grown up. they are people we can be proud of, who are not just idols but well-adjusted individuals with a good attitude towards life! I heard from a friend long time ago but it kinda stuck inside my head. that is after aiba scandal, she said that she read somewhere that sho was blowing a kiss to everyone who hold aiba’s uchiwa at concert. i dunno how far the truth is… i kinda like that kind of friendship. supporting a friend in need. awww. there are all sorts of talk swirling about in the fandom, like that one time Aiba was late and Nino apologized on his knees to the staff, or when during that scandal, J&A threatened to kick Aiba out but the four opposed it. also, when that scandal about Nino and Masami came out and he made a vague address to the fans during their concert that he’s fine, fans said J was teary-eyed. they’ve always watched out for one another and nothing could be truer than what Sho said recently that they learned to lean and depend on each other in those 15 years, and without doing that, it wouldn’t have been possible for them to last this long. This entry, once again, reminds me why I love Arashi so much. These 15 points are so right on! Some of them I’m sure fans forget now and then. These are what makes Arashi seem so “real” to me. They emphasize what’s important to them as a group and as individuals, which makes fans like me realize the value and worth behind it. they’re so down-to-earth and easy to relate to. I guess that’s their appeal. I guess the best thing to drive home that point is how people call to Aiba when he’s out lol: “Aiba! Aiba! Aiba!” without the honorifics. it’s in how real and simple they are that makes me appreciate and love them more. thanks for the comment and sharing your thoughts! I think those things made me love Arashi instantly. I can’t hold myself.. kyaaa. though I just can see arashi from my PC, I can feel how they love each other, how they value their bond. thanks for the awesome.